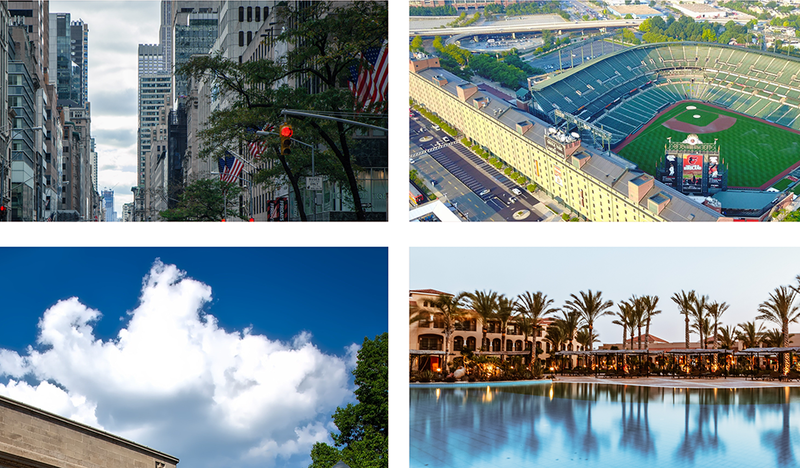 Real estate industry professionals continue to express confidence that the U.S. economy and real estate markets are gaining momentum, and are likely on a clear path to a sustained recovery. 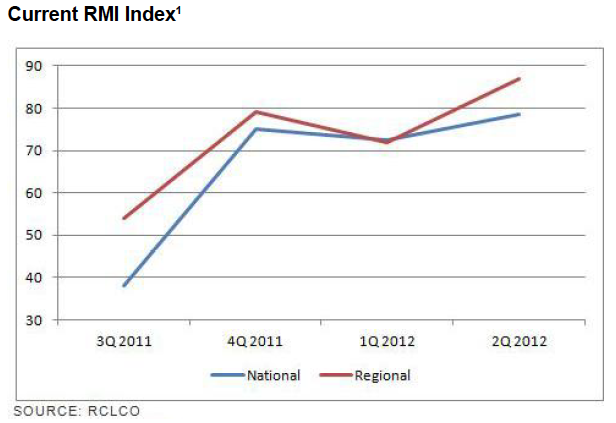 Both components of the RCLCO Real Estate Market Index (RMI)1—Current and Future—remained in solidly positive territory in the first quarter of 2012, consistent with the previous quarter. Both indices remained well above 60, which indicates robust or clearly improving economic and real estate market conditions. 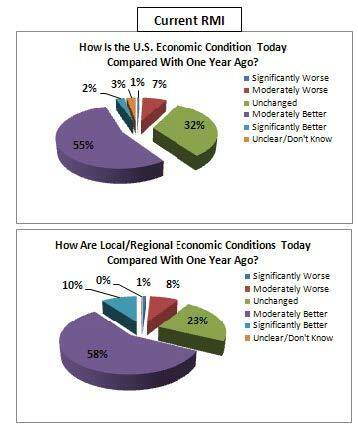 Perhaps the most encouraging result from the lat- est RCLCO survey is that more than twice as many respondents reported that both the overall U.S. and their local or regional markets are “Significantly Better” compared with one year ago, and are likely to continue to be “Significantly Better” over next 12 months. 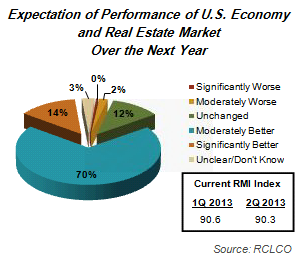 The Current RMI in the first quarter of 2012 was at a level of 73 for the U.S. overall, and 72 for Local/Regional markets, both very positive indicators. 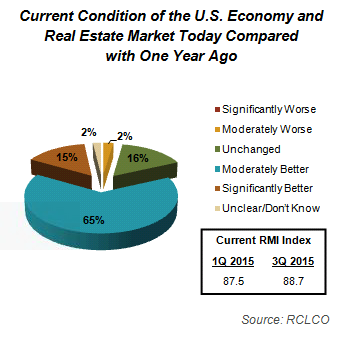 Over three- quarters of respondents view the markets as “Better” today, compared with less than 40% when RCLCO first began the survey back in 2009. 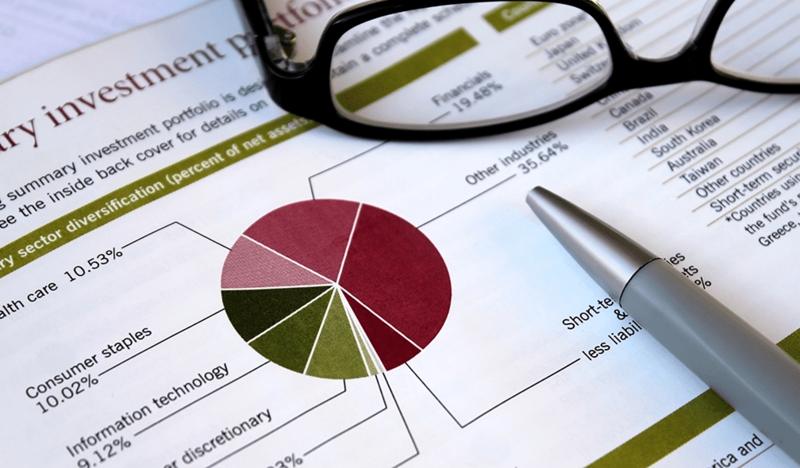 Despite some disappointing jobs numbers for March, real estate industry professionals continue to be optimistic about the future prospects for the economy and the real estate markets. 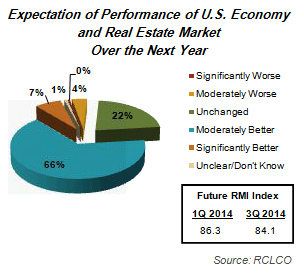 The Future RMI for the U.S. slipped to 74, compared with 82 in the previous quarter, but remained in a very positive range. 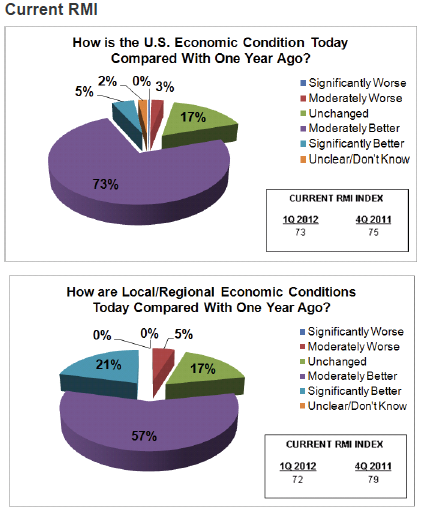 Similarly, the Local/Region- al market sentiment dipped 10 points since the previous quarter for a Future RMI of 74, but also is indicative of a high level of optimism about the near term future. 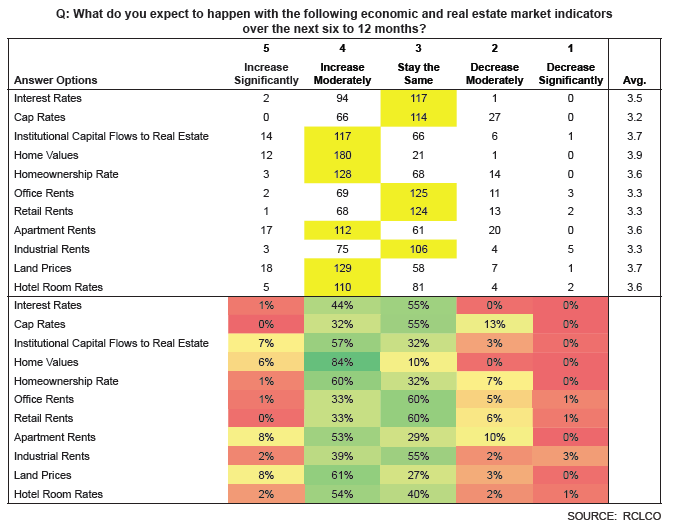 Continuing the positive vibe from 4Q 2011, over 80% of the respondents expect the economy and real estate markets will be either moderately or significantly better over the next year. 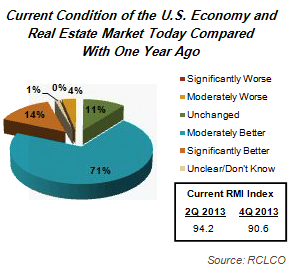 The first quarter 2012 survey marks the first time since the Great Recession began that For Sale Residential and Land moved into positive territory. 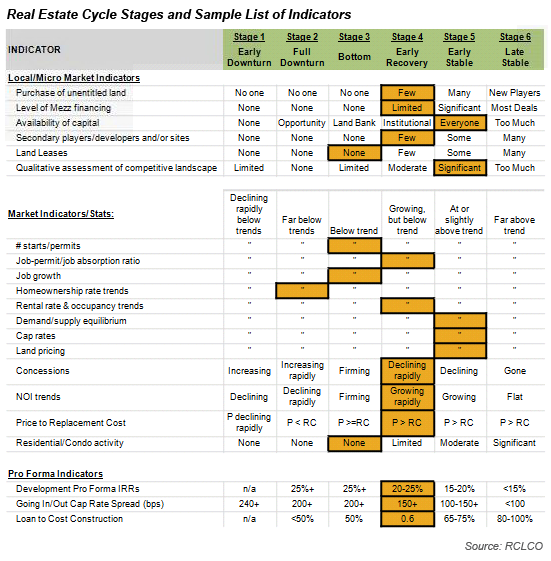 While relatively few respondents to the RCLCO survey reported these land uses in “Full Recovery” mode, the momentum for both is decidedly positive. 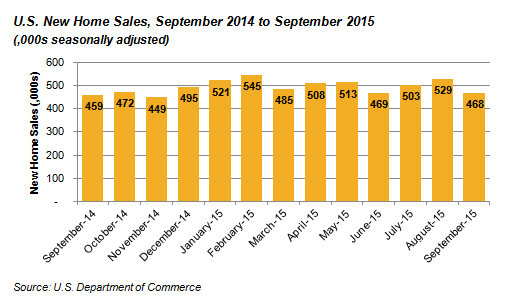 Over 60% reported For Sale Residential was “Improving,” compared with just 31% in the previous quarter. 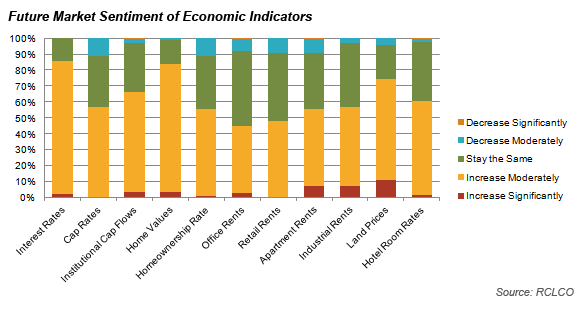 The momentum for Resort/2nd Home is also strongly positive, but at a fairly low level of confidence – nearly 60% of survey respondents report this land use is “Flat/Bumping Along the Bottom.” Similarly, Retail has strong positive momentum, but has yet to break the 50% mark on confidence. 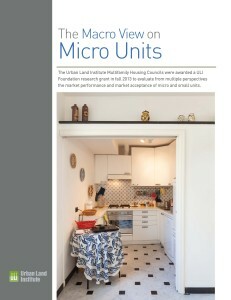 While sentiments vary widely by land use, the fact is that many more land uses are experiencing positive momentum. 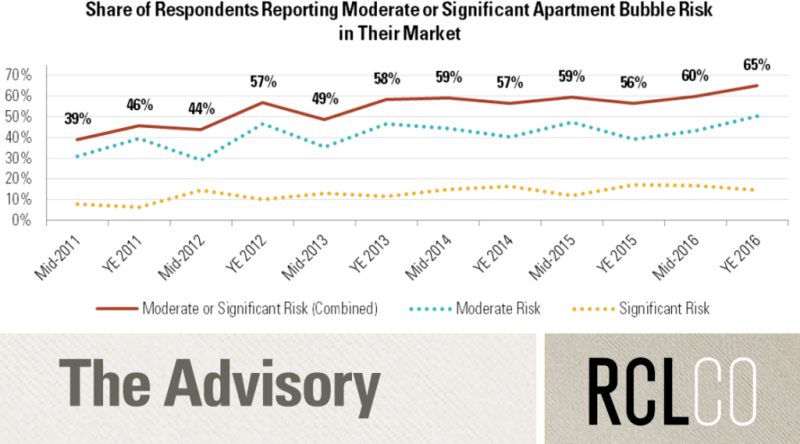 Multifamily Rental continues to outperform all other land uses, and while the Momentum Index for this land use is Flat, it is stable at a very high level of confidence. 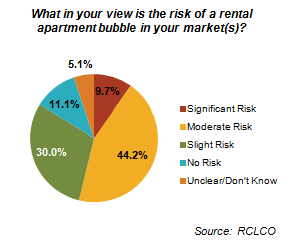 If there is a chink in the Multifamily Rental suit of armor, it is the fact that an increasing number of respondents believe there is the risk of an apartment bubble in their markets. 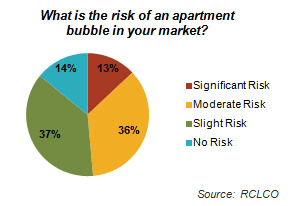 A total of 44% believe there is a “Moderate” or “Significant” risk of an apartment bubble. 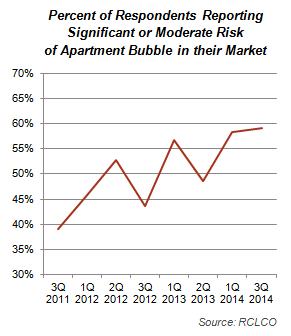 This is up modestly from 38% back in the second quarter of 2011. 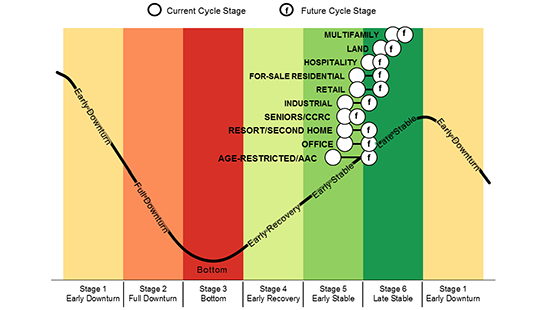 A critical question is when various real estate markets and specific land uses will return to “Full Recovery” mode. 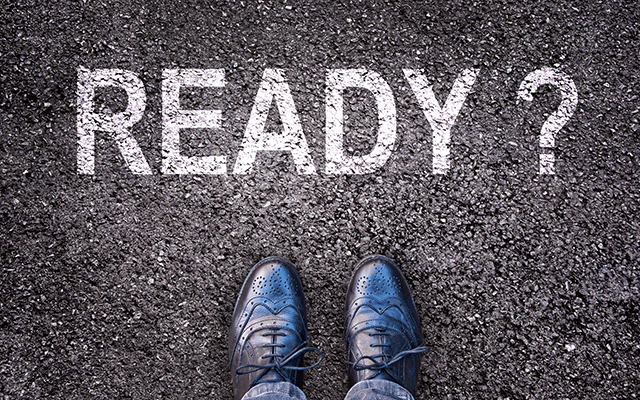 Based on the results of the latest RCLCO survey, real estate industry participants continue to expect the market to take some time to fully recover. 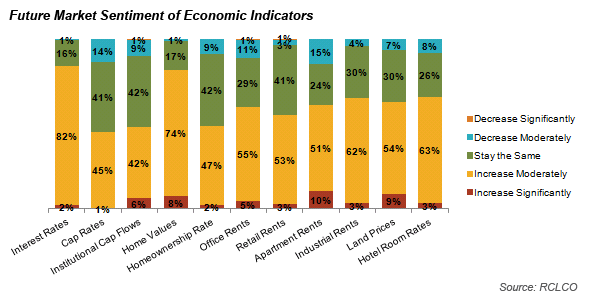 Other than Multifamily Rental, where nearly 60% report this land use already in Full Recovery mode, most expect other land uses to take one to two more years before we see a return to a new normal. 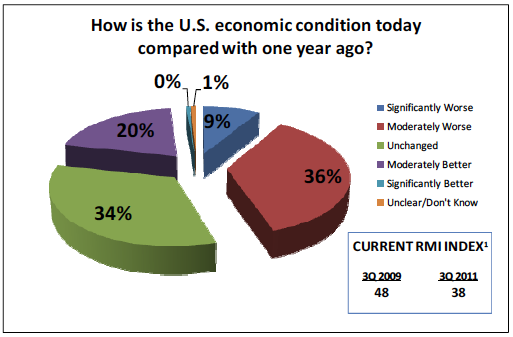 The exceptions to this are Resort/2nd Home and Land, where the sentiment is even more pessimistic with Full Recovery mode not expected for more than two years. 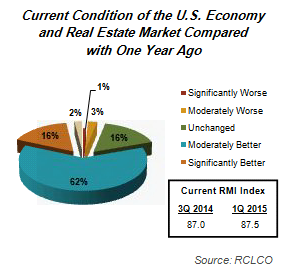 The latest RCLCO sentiment survey reinforces our belief that the U.S. economy and real estate markets are on the road to recovery. 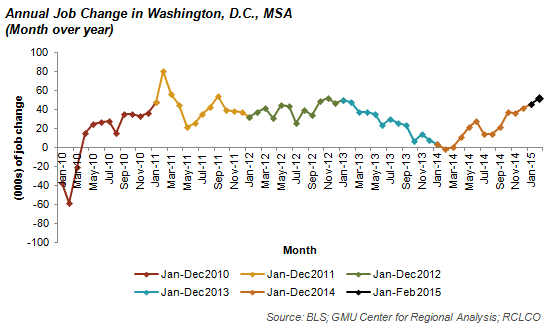 There will be some bumps along the way, with the recent disappointing March jobs numbers as the most recent example, but we expect steady, albeit modest, growth that gains momentum in 2012 and beyond. 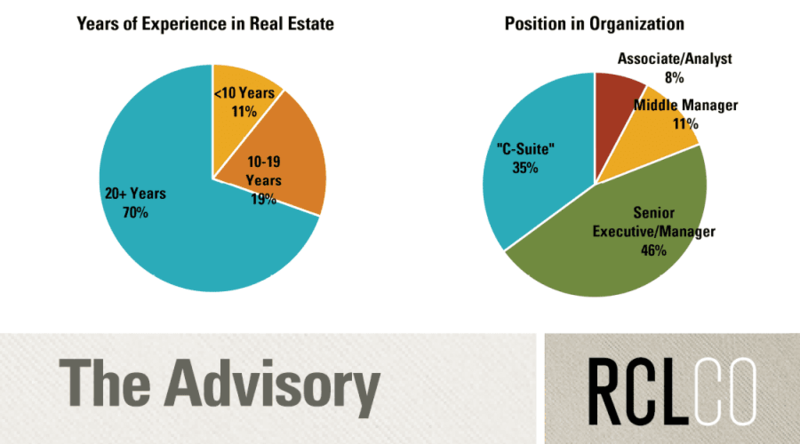 For more information, please contact Charles Hewlett at chewlett@rclco.com or at (240) 644-1006. There is a great debate these days about the future of the American office. Some have argued that the current thumb rule of 200 square feet per employee will shrink to as little as 50 square feet per employee by the year 2015. 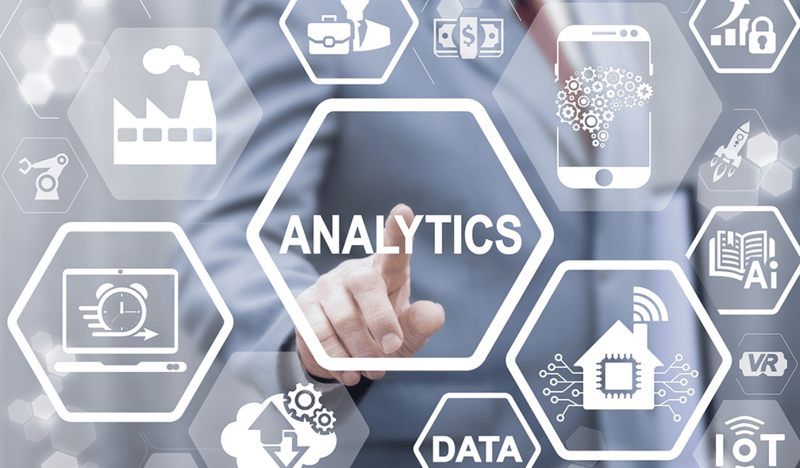 The General Services Administration (GSA), the Federal government’s landlord, has recently announced that it plans to reduce its office footprint from the current average of 210 square feet per employee down to just 110 square feet per employee. 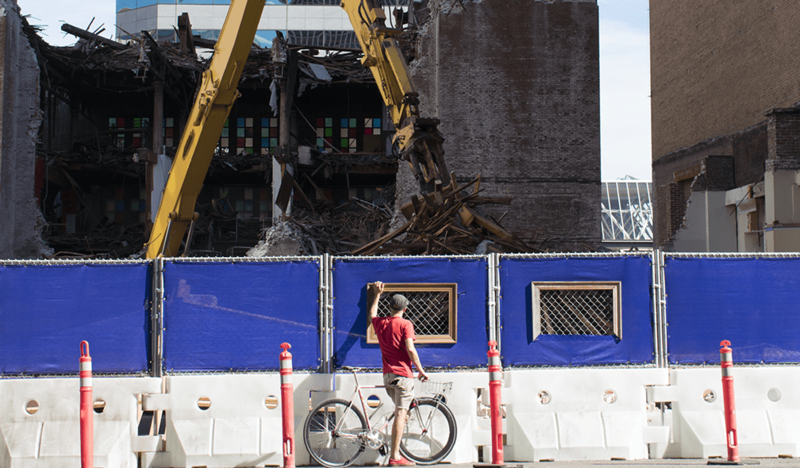 They will do so by making more effective use of their existing space, and dramatically increasing teleworking, shared office use, and hoteling. 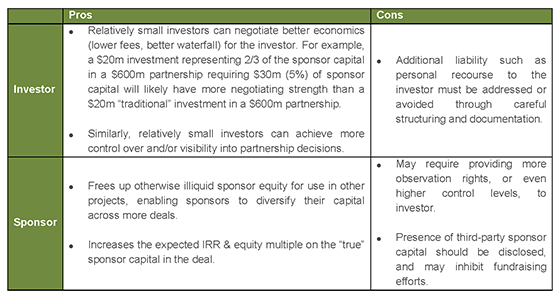 Others are skeptical, to say the least, that the GSA, or corporate America, will move en masse in this direction. Experts on this side of the debate argue that, yes, while fewer workers may need to work in the corporate headquarters given advances in technology and communication, not everyone can, nor will they want to, work from home or out of the neighborhood Starbucks. 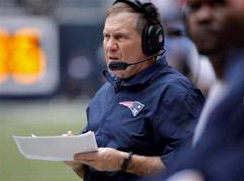 Furthermore, it will be very difficult to recruit skilled workers and have them all work in 50 square feet?! 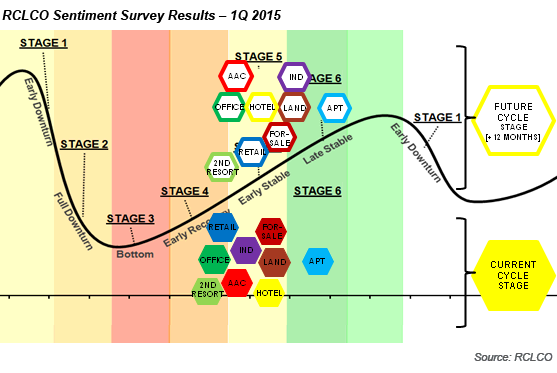 We asked real estate professionals where they stand in this debate. The vast majority of respondents believe that space requirements per employee will in fact go down, but only by a relatively modest 5% to 20%. Approximately 14% believe that space require- ments will shrink by as much as 20% to 40%, and 12% expect that space users will make no reduction in office space needs. Almost nobody responding to the survey felt office users would reduce their space requirements by 40% or more. Good luck with that, GSA.